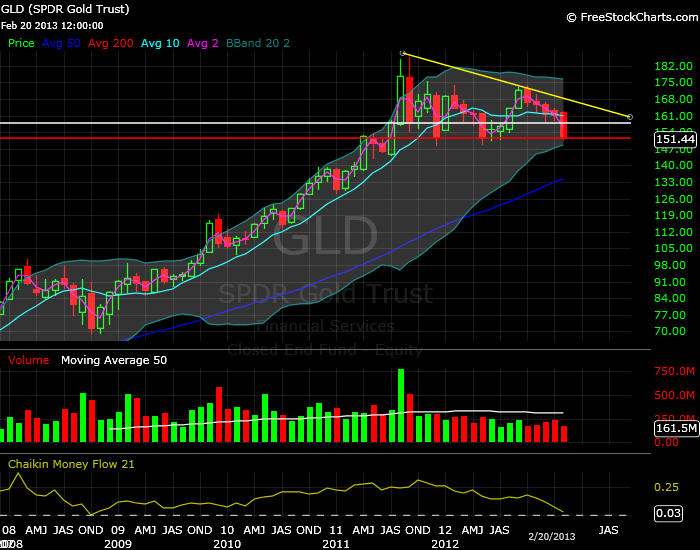 Today I added a few shares of GLD into my portfolio as Gold suffered a huge sell off. As I wrote in my previous post I believe the today’s price action is an overreaction of investors, most likely responding to (outdated) report from Sorros Fund Management. First take a look at 5 year chart, which nicely shows the new support line formed in October 2011. The red horizontal line indicates the support at which I originally placed a trigger buy order ($151.60 a share) and honestly I haven’t expected the price ever touch this level again. In this chart you can see a very extended bearish candle and trippled volume. In my opinion this is a bearish exhaustion and we may experience a rebound. This price action also triggered my buy order today and I added shares to my portfolio. 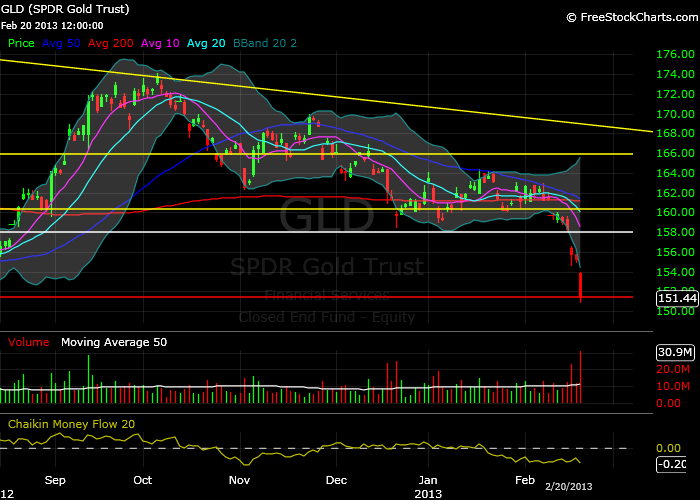 This trade lowers my cost basis in GLD from $164 a share to $160 a share. Yes, I buy physical Gold. Yes, I buy Gold as ETF. No, Gold is not a good investment. Marvin, it is my goal with Gold as well to save enough cash and have at least 100 shares of GLD so I can sell puts and calls and have it secured by cash or stock. Not much comfortable selling naked. I believe the gold correction is an overreaction as well. I recently opened up a position selling a put of a gold mining company.